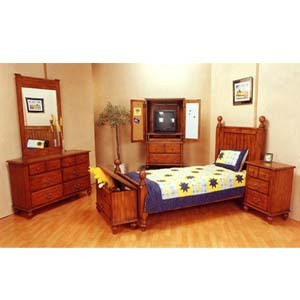 5-Piece Brandon Collection Bedroom Set. Bed Is Available In Twin And Full Sizes. Includes Drawer Night Stand, Dresser, Mirror, Chest. Also Available (Not Included In The Price) Toy Chest, T.V. Armoire, Computer Desk And Hutch, And Chair (See Related Items At The Bottom Of The Page). The Brandon Collection Is A Classic Looking Bedroom. Its Turned Finial Posts, Framed Panels And Combination Of The Wood And Metal Handles Complete This Set. Details: Twin mission bed: Length: 83-1/2 x Width: 42-1/2 x Height: 52 / Height: 28 Full mission bed: Length: 83-1/2 x Width: 57-1/2 x Height: 52 / Height: 28 Drawer Night stand: Length: 23 x Width: 16 x Height: 28-1/2 Dresser: Length: 54 x Width: 17 x Height: 30 Mirror: Length: 34 x Width: 2 x Height: 45 Toy Chest: Length: 36 x Width: 14 x Height: 20 TV Armoire: Length: 36 x Width: 19 x Height: 58 Chest: Length: 34-1/4 x Width: 19 x Height: 46 Computer Desk: Lenght: 44 X Width: 20 X Height: 30. Computer Hutch: Lenght: 42-1/2 X Width: 12 X Height: 48. Chair: Lenght: 17-3/4 X Width: 21 X Height: 32.